Experiencing “traffic jams” on your network? A bogged-down network is the first sign that your business needs a new network switch. Effieciently managed network traffic is essential to your businesses overall network productivity and, thankfully, Cisco Systems manufactures industry-leading switching hardware to meet your growing needs. Whether you need a simple OSI layer 2 switch or an advanced layer 4-7 device, Cisco’s broad catalog of switches has a device for you. Cisco network switches provides enhanced functionality and intelligence to help organizations simplify and automate complex tasks while supporting new application and business requirements. The Cisco’s comprehensive portfolio of intelligent network switches offers the networking consumer a continuously expanding suite of superior services and intelligent technologies to strengthen, simplify, helping deliver the greatest investment protection available. Don’t be intimidated by industry jargon, give us a call at (866)-IT-ASSET and let us help you decide which Cisco switch is right for your business! What is a switch? A network switch is a networking device that connects two or more nodes (computers) together within one Local Area Network (LAN). It “switches” the traffic between the two nodes. While there are different types of switches (Ethernet, Gigabit, 10GbE, etc) with various features and port densities, a network cannot exist without one. If you imagine each desktop computer (or node) as a house, switches act like streets connecting each computer in a network, allowing them to communicate and share network resources. Now imagine each network as a city, routers act like a freeway connecting one network to other networks. (more information on routers can be found at Cisco routers). 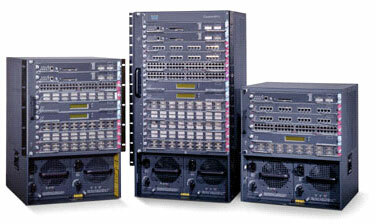 Townsend Assets (TAG) sells all models of Cisco Systems Switches including Cisco Catalyst (including the 2900, 3500, 4000, and 6500 series) and the Cisco Aironet (the 300 and 350 series). As the world’s largest reseller of refurbished Cisco hardware, we offer an extended 1-Year warranty to end-users for every piece of gear we deliver. This warranty includes advance replacement, which means when you call us to report a problem, our technical team will work with you quickly to assess the problem. If we cannot overcome it, we ship a replacement unit immediately. Your sales rep will then provide an email to you with RMA instructions for returning the faulty unit.